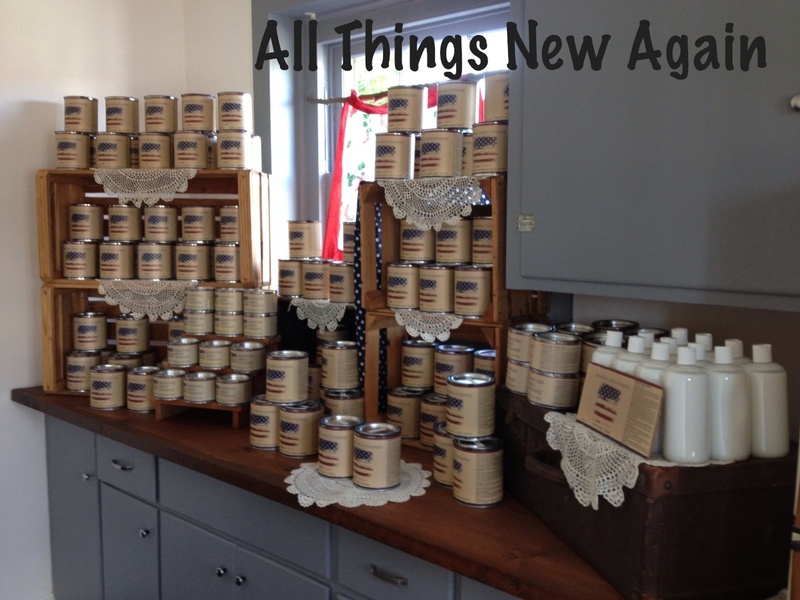 Here’s a look at one of the projects we have been working on to make our All Things New Again shop, well, new again. 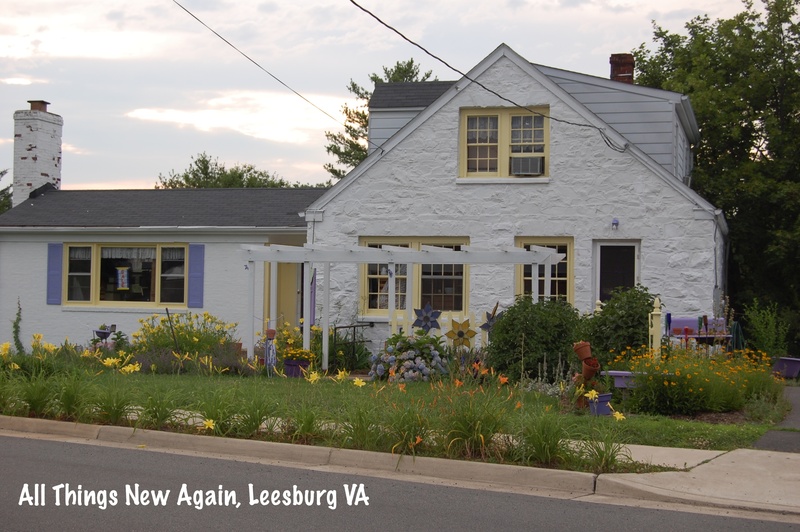 Our little white house in Leesburg, VA is almost 70 years old. The area has changed a lot over those decades—and so has the house. A local family called it home for many years, it served as office space for a Realtor, and the American Red Cross once held CPR classes here. For the past 15 years, it was home to our shop called Sawdust Specialties. When we bought the house in 1998, we painted the rooms and hung up our open sign. We had plenty of ideas for improvements, but we were so busy running the shop that we never got around to doing them. The concept behind our new shop, All Things New Again, is to take old furniture that has seen better days, fix it up or repurpose it, and create something beautiful again. It was time to do the same for our house. Courtney stamped those sunflowers onto the cabinets in 1998. They were fashionable at the time—but that was a long time ago! The carpet was so old that no matter how much you vacuumed, it never really looked clean. And the sink hasn’t worked in years. 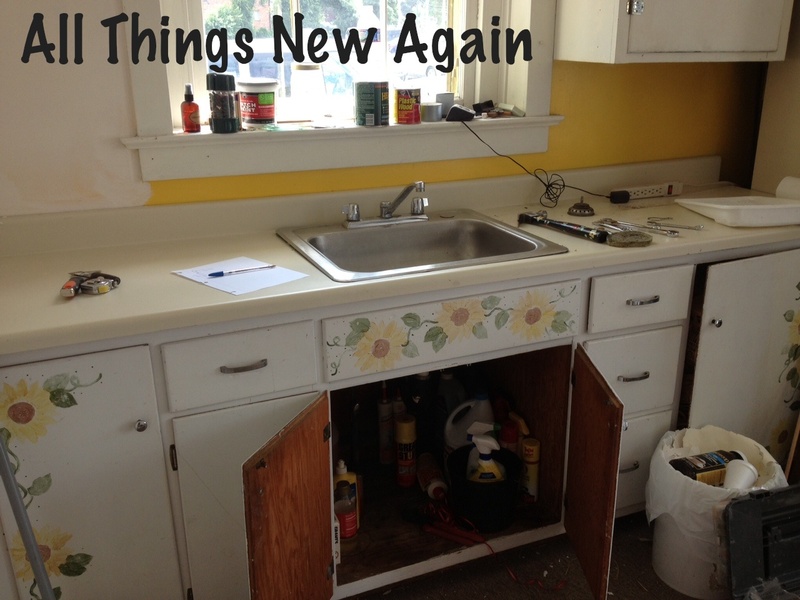 We started with the cabinets. Bye-bye sunflowers! One wall only had top cabinets, which Dave removed to make the entire room look bigger. 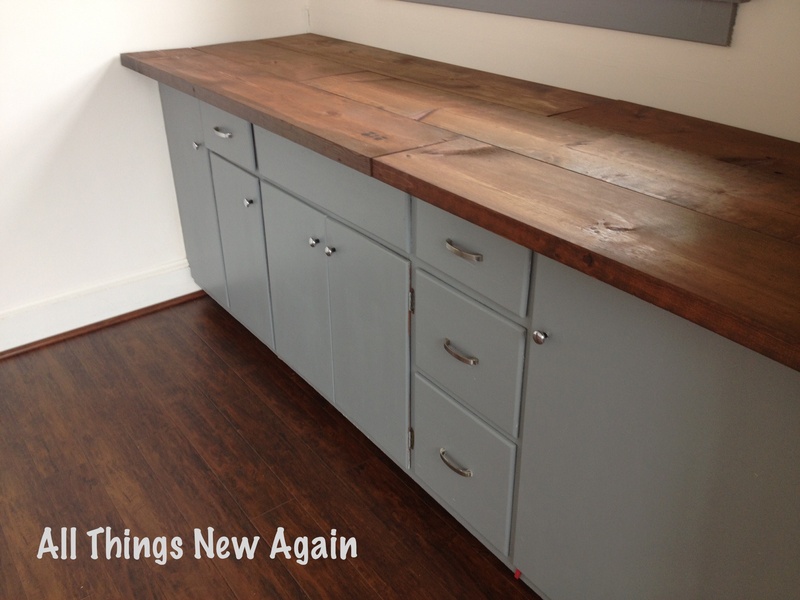 I painted the remaining cabinets gray with paint leftover from our library project at home. We are all about repurposing! We will find a new use for the cabinets we removed, probably somewhere in our new studio. But that is a project for another day. Speaking of repurposing, check out the new countertop. Those planks were once the frame of an old waterbed. We haven’t had the bed in years, but somehow the planks ended up on a pile in our basement at home. This project saved us a trip to the dump—and it looks great! Dave capped off the pipes to the broken sink, removed the faucet, sink and outdated countertop, and installed the repurposed waterbed planks. We stained them to reveal beautiful wood grain. This became the perfect spot for our American Paint Company paint display. We are excited to be the exclusive Loudoun County retailer for this brand-new, 100% all-natural clay, chalk and mineral based paint. Next, we moved onto the floor. That carpet had to go. Many years ago, a very special customer came into the shop. This lady grew up in our little white house! She remembered beautiful hardwood floor throughout the place. We tried to find it. 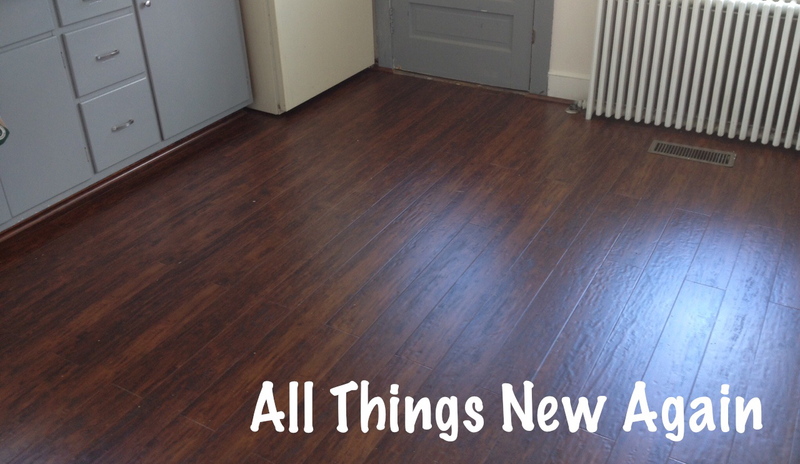 We pulled up the carpet in the kitchen to reveal … more ugly carpet! 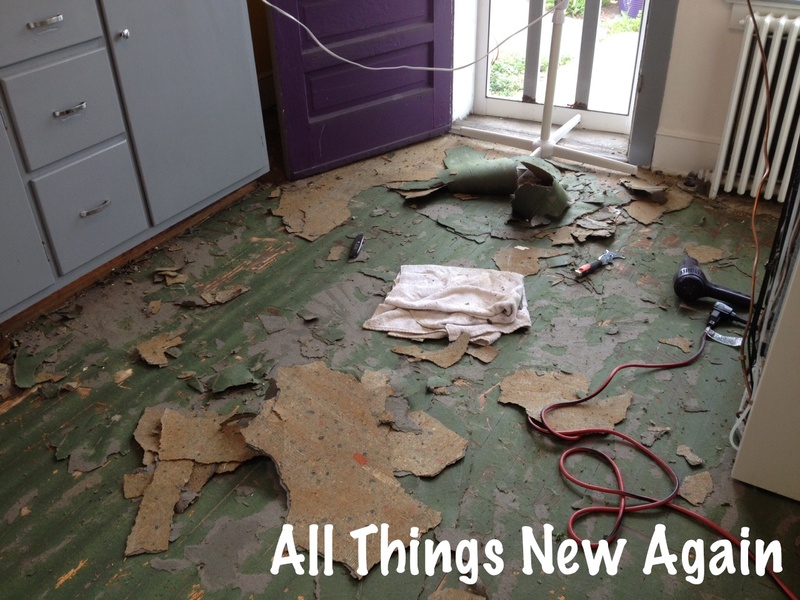 After the second layer of carpet was removed, we found … ugly old linoleum! The linoleum was covered and smothered in layers and layers of glue that proved incredibly challenging to scrape away. Dave ended up installing new laminate flooring. It isn’t the original hardwood, but it looks much better than the carpet—and it matches the new countertop perfectly. After a few coats of gray paint to cover up the old bright yellow walls, we started on another repurpose project for the wall treatment. 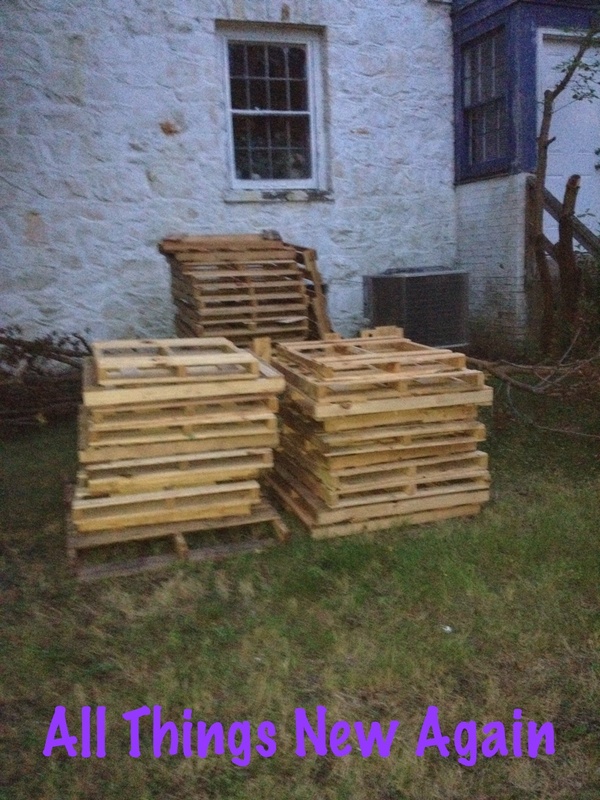 Dave and Courtney were out treasure hunting one day and found a big stack of wood pallets next to a Dumpster. They filled up the van. 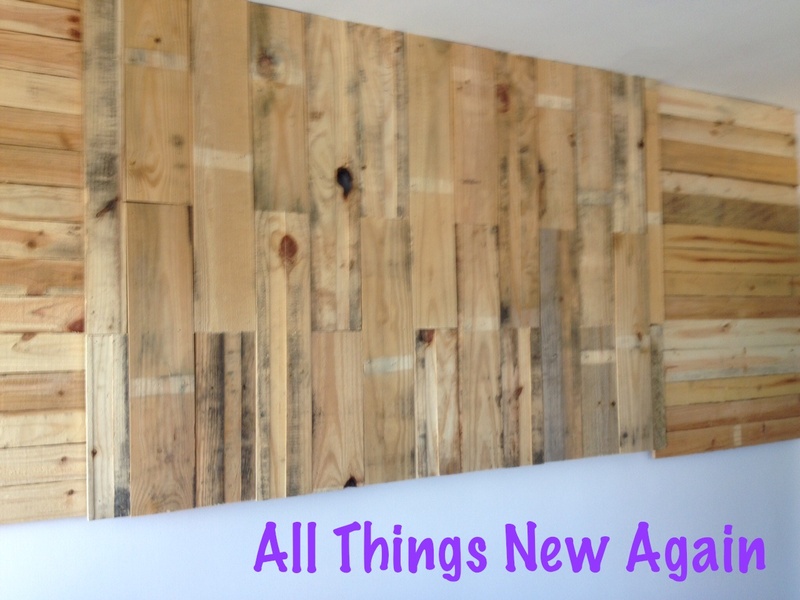 Dave pried the boards off the pallets and created this neat design on the wall. 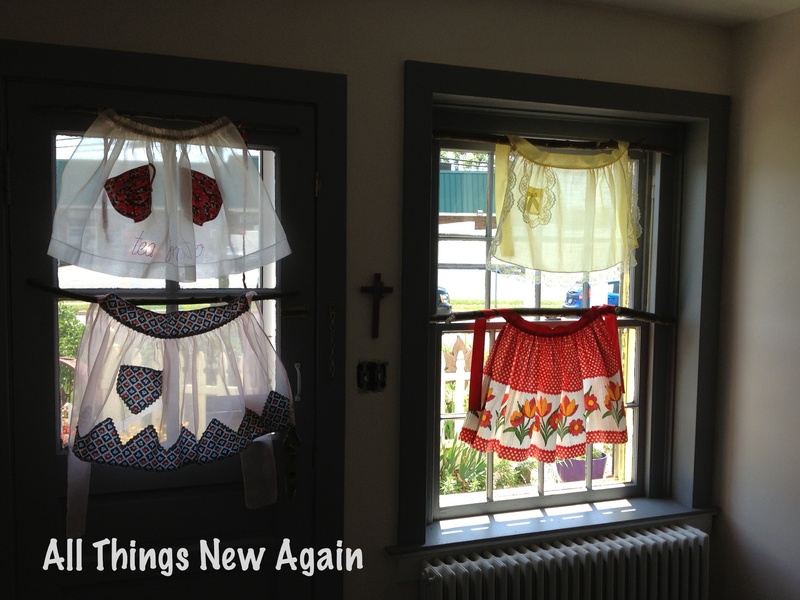 Finally, the windows needed some frilly pops of color to liven up all of this wood and gray. I saw this idea in a restaurant where we ate on vacation. They hung vintage aprons as curtains. We did the same thing—only we used branches from the mulberry tree Dave trimmed as our “curtain rods”. Talk about repurposing! And I love our new, updated, repurposed kitchen! Please stop by to see it the next time you are in town. We do not have set hours this summer, but Dave and I are up here working on the house pretty much every day. If you see the “open” flags, come on in! We have so many new ideas to show you! Great makeovers! I love the design.